At Backblaze we now have 34,881 drives and store over 100 petabytes of data. We continually track how our disk drives are doing, which ones are reliable, and which ones need to be replaced. I did a blog post back in January, called â€œWhat Hard Drive Should I Buy?â€ It covered the reliability of each of the drive models that we use. This month Iâ€™m updating those numbers and sharing some surprising new findings. Losing a disk drive at Backblaze is not a big deal. Every file we back up is replicated across multiple drives in the data center. When a drive fails, it is promptly replaced, and its data is restored. Even so, we still try to avoid failing drives, because replacing them costs money. We carefully track which drives are doing well and which are not, to help us when selecting new drives to buy. The good news is that the chart today looks a lot like the one from January, and that most of the drives are continuing to perform well. Itâ€™s nice when things are stable. The surprising (and bad) news is that Seagate 3.0TB drives are failing a lot more, with their failure rate jumping from 9% to 15%. 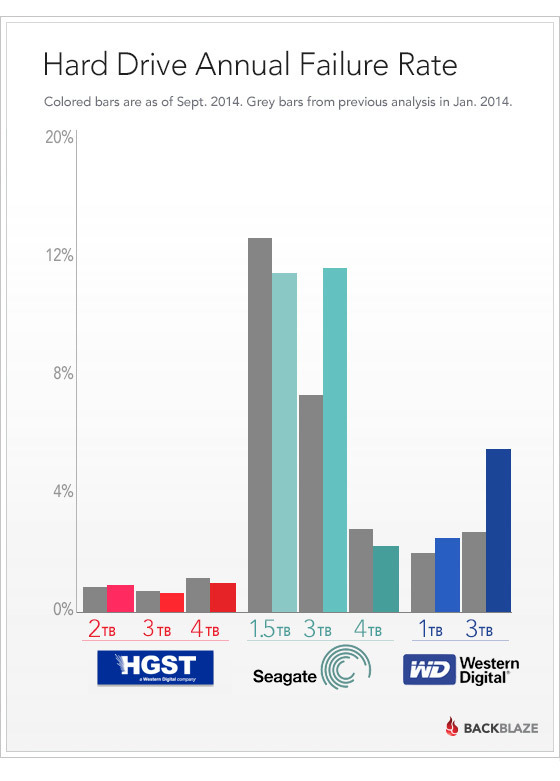 The Western Digital 3TB drives have also failed more, with their rate going up from 4% to 7%. In the chart below, the grey bars are the failure rates up through the end of 2013, and the colored bars are the failure rates including all of the data up through the end of June, 2014. You can see that all the HGST (formerly Hitachi) drives, the Seagate 1.5 TB and 4.0 TB, and Western Digital 1.0 TB drives are all continuing to perform as well as they were before. But the Seagate and Western Digital 3.0 TB drives failure rates are up quite a bit. What is the likely cause of this? It may be that those drives are less well-suited to the data center environment. Or it could be that getting them by drive farming and removing them from external USB enclosures caused problems. Weâ€™ll continue to monitor and report on how these drives perform in the future. Should we switch to enterprise drives? Assuming we continue to see a failure rate of 15% on these drives, would it make sense to switch to â€œenterpriseâ€ drives instead? Today on Amazon, a Seagate 3 TB â€œenterpriseâ€ drive costs $235 versus a Seagate 3 TB â€œdesktopâ€ drive costs $102. Most of the drives we get have a 3-year warranty, making failures a non-issue from a cost perspective for that period. However, even if there were no warranty, a 15% annual failure rate on the consumer â€œdesktopâ€ drive and a 0% failure rate on the â€œenterpriseâ€ drive, the breakeven would be 10 years, which is longer than we expect to even run the drives for. The assumption that â€œenterpriseâ€ drives would work better than â€œconsumerâ€ drives has not been true in our tests. I analyzed both of these types of drives in our system and found that their failure rates in our environment were very similar â€” with the â€œconsumerâ€ drives actually being slightly more reliable. This table shows the detailed breakdown of how many of which drives we have, how old they are on average, and what the failure rate is. It includes all drive models that we have at least 200 of. A couple of models are new to Backblaze and show a failure rate of â€œn/aâ€ because there isnâ€™t enough data yet for reliable numbers. We use two different models of Seagate 3TB drives. The Barracuda 7200.14 is having problems, but the Barracuda XT is doing well with less than half the failure rate. There is a similar pattern with the Seagate 1.5TB drives. The Barracuda 7200.11 is having problems, but the Barracuda LP is doing well. While the failure rate of Seagate and Western Digital 3 TB hard drives has started to rise, most of the consumer-grade drives in the Backblaze data center are continuing to perform well, and are a cost-effective way to provide unlimited online backup at a good price. 9-30-2014 â€“ We were nicely asked by the folks at HGST to replace the name Hitachi with the name HGST given that HGST is no longer an Hitachi company. To that end we have changed Hitachi to HGST in this post and in the graph.